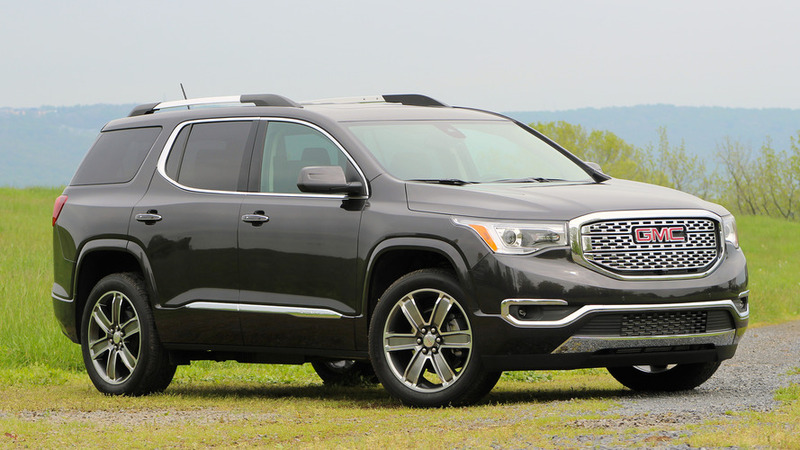 For the 2017 model year, GMC totally revamped it’s three-row SUV, the Acadia. Built upon new architecture, it’s been designed from the ground up to be safer, lighter, and more efficient, while providing the sort of smart technology we’ve all integrated into the very fabric of our lives. At first glance you might not notice it, but the new Acadia is quite a bit smaller than before, bucking the usual trend of models becoming more bloated with each new generation. And despite a couple complaints, there’s no question that utility is still very much present in the Acadia, with practicality, comfort, and user-friendliness at the forefront. Bold styling is the look GMC is after with its whole portfolio. While it’s not bold in the sense that it is pushing aesthetic boundaries, the Acadia does have a certain machismo to its exterior. It looks big, sturdy, and imposing, though in actuality the new Acadia is slightly smaller than the model it replaces. Regardless of the trim level, this crossover looks rugged and versatile. 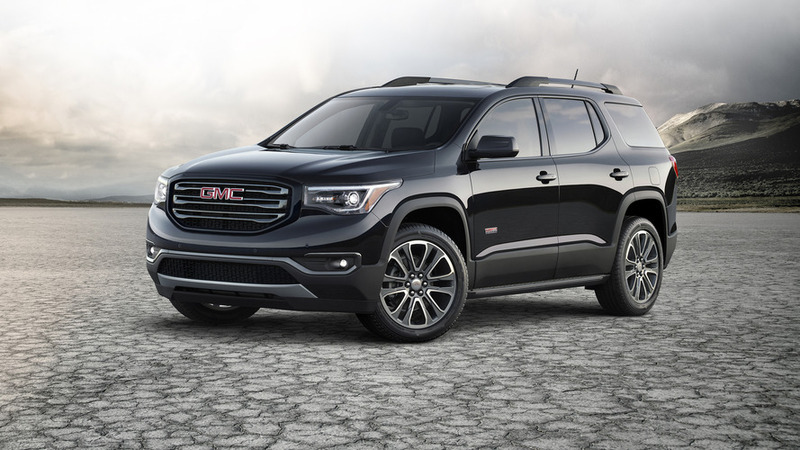 The upscale Denali adds touches of chrome and an impressive grille that easily sets it apart from lesser trim levels. The 20-inch, polished aluminum wheels on our Denali tester make it look like it could drive over a whole mess of stuff with style. No, I didn’t get the chance to crush anything with the Acadia, but it felt perfectly comfortable traversing a bumpy lawn. GMC shaved about 700 pounds off the Acadia for 2017. While some of those savings (about 200 pounds) come from its smaller dimensions, 280 pounds come from structural improvements, such as the use of high-strength steel. GMC trimmed even more fat by using lighter, dissipative materials to absorb sound. The result is a still-quite-large SUV that feels relatively nimble and is less thirsty for fuel. 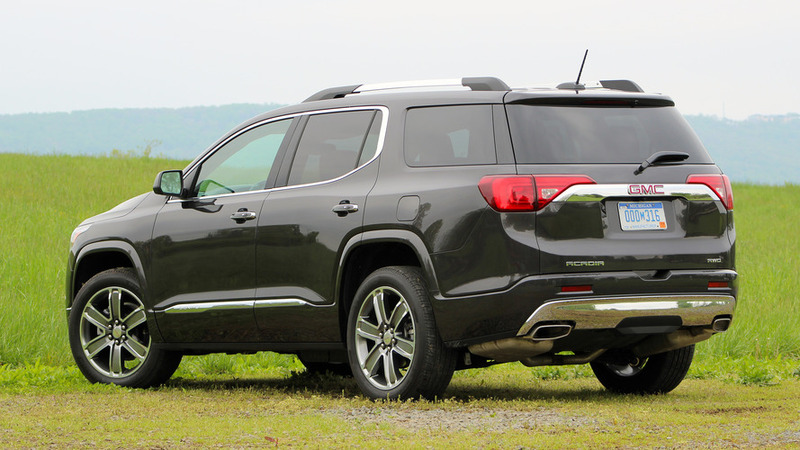 It also allows GMC to offer the Acadia with a humble four-cylinder motor in base models (more on that in a minute). It looks big, sturdy, and imposing, though in actuality the new Acadia is slightly smaller than the model it replaces. Matching the manly looks of the Acadia is a capable 3.6-liter V6 engine providing 310 horsepower and 271 pound-feet of torque (up from 288 horsepower and 270 pound-feet in the previous model). It operates smoothly, sounds virile under hard acceleration without being loud, and has no trouble getting the Acadia moving quickly, even uphill. It uses cylinder deactivation to save fuel when appropriate, which helps it achieve its fuel economy ratings of 18 miles per gallon city and 25 mpg highway (an improvement over the 2016 model’s 16/23 city/highway rating). That said, maximum towing capacity suffers – the Acadia can only pull 4,000 pounds of stuff, compared to 5,200 pounds for its predecessor. The Acadia I spent most of my time testing was the V6-equipped Denali with all-wheel drive, which is probably how I’d spec it if I were the person plunking down my money to buy one. It feels like the most cohesive, well-rounded package. Also available is a 2.5-liter, naturally aspirated four-cylinder engine. 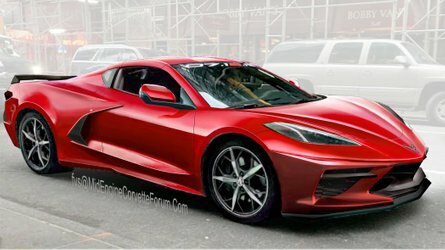 It puts down 194 horsepower and 190 pound feet of torque. With front-wheel drive, this Acadia gets 21 city/25 highway mpg, with all-wheel drive sacrificing 1 mpg highway. Its automatic stop-start system is relatively unobtrusive, as is often the case when paired with smaller-displacement engines. While the four-cylinder engine feels adequate in terms of livability, it’s not nearly as satisfying to use as the V6, with slowish acceleration and an uninspiring engine note. 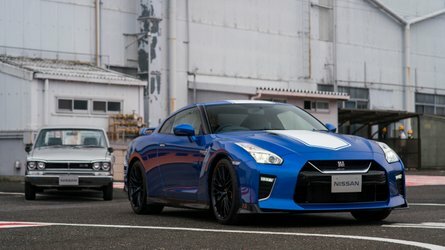 It also seems like the six-speed automatic transmission has a little more trouble picking the right gear, especially when compared to the relatively seamless operation with the V6. Also, you may have noticed that the I4 is just as efficient on the highway, so unless the vast majority of your driving is done in town (or if you’re eyeing the lowest trim levels where you can only get four-cylinder power) choosing the V6 ought to be a no-brainer. The narrow, winding roads through the foothills of the Blue Ridge Mountains were a perfect playground in which to see just how well the new Acadia handles itself. While the crossover is dimensionally smaller than before, it still feels quite substantial, approaching huge, from behind the wheel. That’s probably why I was pleasantly surprised with how composed the Acadia felt tracing curves of various radii over a rolling landscape. The I4 is just as efficient on the highway, so unless the vast majority of your driving is done in town, choosing the V6 ought to be a no-brainer. In what was perhaps the most profound facet to the whole Acadia experience, sawing back and forth through the turns, the burly ute actually felt impressively pliant to my commands. There’s not a lot of feedback through the steering wheel, but the heft is appropriate and inspires confidence. Even as a passenger, the ride feels stable, and though there is a little bit of body roll, I didn’t feel like I was sliding around in the wide seats. Also, this tester’s continuously variable, real time damping system really helped the ride feel smooth and carlike. The comfort of a car is often sacrificed for the roominess and stance of a truck-ish SUV, but that’s simply not so with the Acadia. At the same time, a combination of the Acadia’s stature and limited forward and side vision make it hard to place on the road. By instinct, I found myself slowing down significantly more than I normally would when approaching oncoming traffic or roadside barriers. It’s simply difficult to gauge the footprint of the Acadia, with its high beltline and hidden corners. Its sense of sheer width makes it a little scary to navigate close to other objects. My other big gripe is that the Acadia tends to drift about in its lane. With precious little space to buffer it from the shoulder or oncoming traffic, keeping this thing pointed forward is paramount to safe, confident driving. Thankfully, the Acadia is available with lane keep assist (it’s a standard feature in the Denali), which, when the road markings are present and clear, does work quite subtly to keep the car reined in. The automatic adjustments are slightly more noticeable than in the Cadillac CT6 I recently tested, gently nudging the Acadia back into its lane without fanfare. While every driver should always pay close attention to what their vehicle is doing and where it is headed, a little friendly help here and there helps take some of the stress out of trying to aim this SUV dead ahead. Maximum cargo space behind the first row comes in at an even 79 cubic feet, down from the generous 116.1 in the 2016 model. Shrinking the Acadia for 2017 does provide gains in efficiency and garage-ability, but it means that you can’t carry quite as much stuff. Maximum cargo space behind the first row comes in at an even 79 cubic feet, down from the generous 116.1 in the 2016 model. With the just third row folded, it provides 41.7 cubic feet (down from 70.1), and there’s 12.8 cubic feet of space (down from 24.1) with all three rows of seating up. Overall, the new Acadia is 7.2 inches shorter in length, at 193.6 inches, with a shorter wheelbase of 112.5 inches (down from 118.9). Overall height is down 4.4 inches, and it’s 3.5 inches narrower. Turning diameter is slightly improved, though, down from 40.4 feet to 38.7 feet. On paper, at least, the downsized Acadia can still run with the big dogs. Compared to its stiffest competition, the Acadia is 4.7 inches shorter than the Ford Explorer with a similar wheelbase, but offers comparable passenger room and more cargo space. 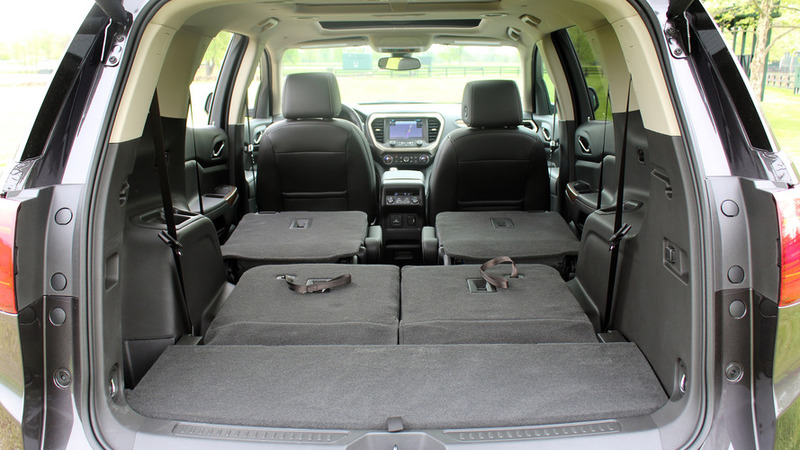 The Acadia is just slightly shorter than the Honda Pilot, with a slightly longer wheelbase, offers about the same amount of passenger room, but the Pilot can seat up to eight and has more space for cargo. The GMC is at least three inches narrower than both competitors. 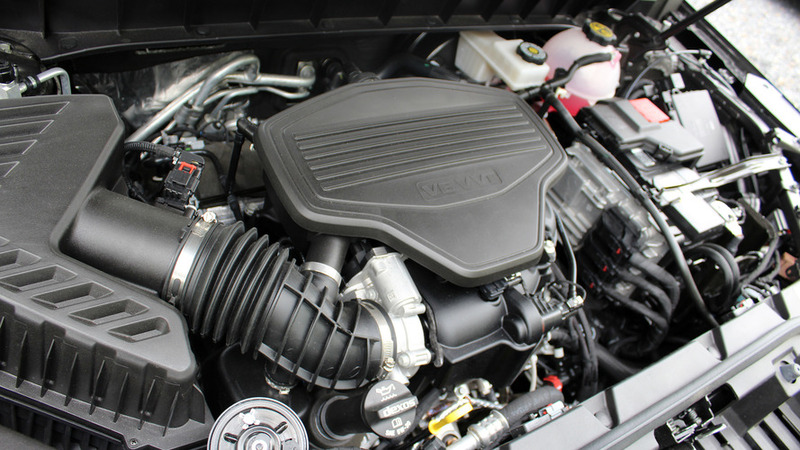 The Acadia’s V6 is more powerful than the Pilot’s (by 40 horsepower) and Ford’s naturally aspirated V6 (by 30 horsepower). The Acadia barely beats the Explorer in fuel economy, and the Pilot just edges out the Acadia in highway mpg, but the GMC can carry a couple extra gallons of fuel, which means fewer stops at the pump. Despite the shrinkage, the Acadia’s passenger volumes are virtually unchanged in the first two rows compared to the 2016 model. The exterior’s visual brawn is carried over into the interior. 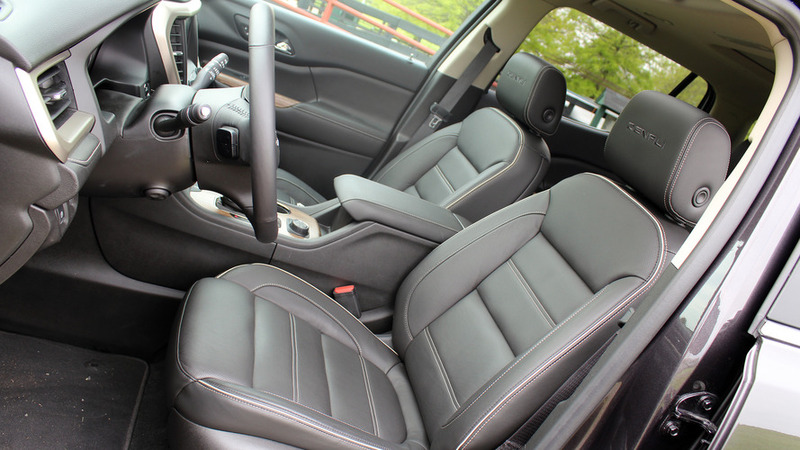 Big chairs, plenty of head, shoulder, and hip room, copious storage compartments, and durable-looking (but not exactly plush) materials make the Acadia feel like it’s ready for some hard work. As a family vehicle, GMC also took advantage of any space it could find to provide clever places to stash everyone’s gear. There are cubbies abound throughout the vehicle. It still feels spacious, and even your beefiest, most claustrophobic son should feel comfortable inside the roomy cabin of the 2017 Acadia. 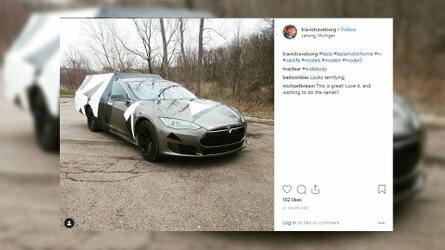 That said, while the overall design of the interior is quite comfortable and useful, the huge amount of plastic offers little in the way of luxury. The Denali’s generous content, though, helps make up for that. While the overall design of the interior is quite comfortable and useful, the huge amount of plastic offers little in the way of luxury. The Acadia Denali includes heated and ventilated front seats, as well as heated second-row seats (just the outboard seats if configured for seven passengers). Those sensitive to the cold will also appreciate the heated, leather wrapped steering wheel. The eight-speaker Bose system is plenty good for most listeners (I’m no high-end audiophile, though, for what it’s worth). The 4G LTE wifi hotspot is great for staying connected on the go. The eight-inch central touchscreen display is easy to use, and the navigation system is as attractive as it is practical. The $1,340 Technology Package takes things a bit further, providing added convenience and safety with adaptive cruise control, full speed front automatic braking, and automatic collision preparation. As far as NVH, there isn’t a lot to complain about. The bulk of the noise entering the cabin comes from the tires, while wind adds just a bit more to the ambient volume at highway speeds. With the aforementioned active damping, too, there’s just not much excess stimulation. You might want to keep the windows rolled up when driving above 40 miles per hour, though; the buffeting I experienced in the Acadia was more than I’ve felt or heard in some time. Just thinking about it now makes my ears ring. A very nice, parent-friendly feature is the rear seat reminder. If you open a rear door – whether it’s to toss in a bag of groceries, purse, or, like me, your large infant son (seriously, he’s a big boy) in his car seat – the Acadia will remind you with a series of chimes and a note on the digital display not to leave anything or anyone behind at the end of your trip. Even good people forget really important things sometimes, and many a busy parent’s worst fear is forgetting their child in a hot car. If you’re the type of person who’d prefer your frozen groceries melt in the summer heat, however, you can disable this feature (at your own peril). 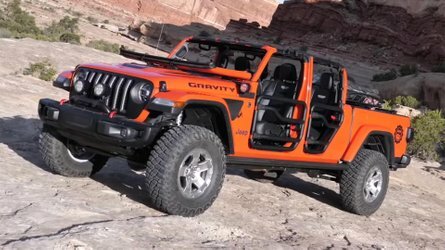 It’s still plenty capable of accommodating a big family trip to Costco or a camping expedition, with enough creature comforts and technologies to keep everyone happy. In terms of connectivity, the new Acadia gets its own in-vehicle apps, including location sharing through Glympse, a Weather Channel app, and At Your Service, which offers deals and rewards for products and services as an extension of OnStar. Other downloads are available through GMC’s own app store, called Shop. Apple CarPlay and Android Auto allow you to use your own smartphone features through the infotainment system, if you prefer to go that route. 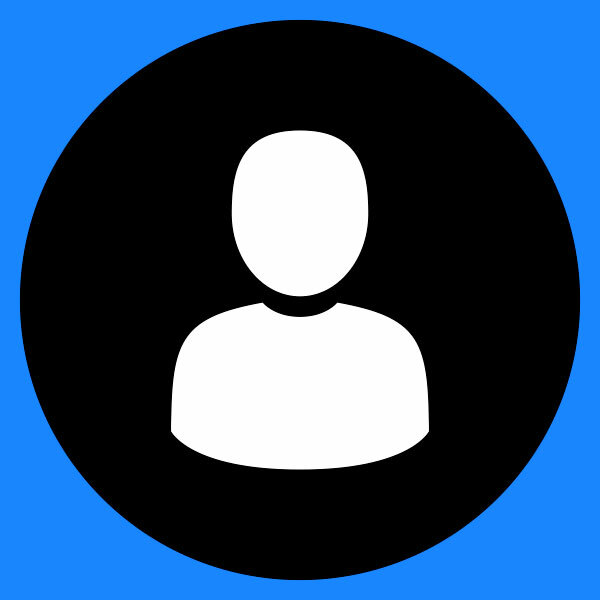 Additionally, the MyGMC smartphone app can help you locate your car, lock your doors, check vehicle status, and perform other functions remotely. 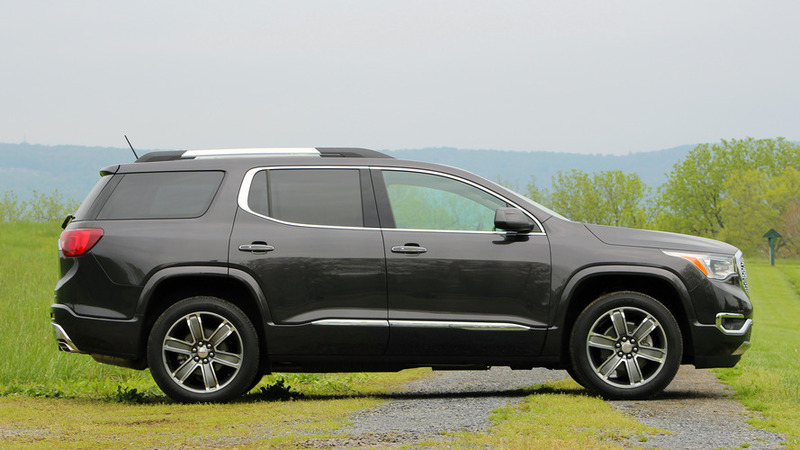 The new GMC Acadia is satisfying in its execution – especially with the Denali treatment – but it won’t exactly blow you away. While some may lament the lost cargo space, the slight downsizing makes this still-sizeable SUV a bit more practical for everyday driving. It’s still plenty capable of accommodating a big family trip to Costco or a camping expedition, with enough creature comforts and technologies to keep everyone happy. Besides, if you need more room, there’s always the Yukon. 2017 GMC Acadia | Why Buy?